Our badge reel lanyards known as lanyo's are designed with access control cards in mind, simply slot your card into a holder and attach this to the badge reel, you then can easily swipe in and out without any need to remove your card. We can design any lanyo to your colour scheme and company logo resulting in a professional and high quality product which will promote your business and increase your company image. The lanyo is of extremely high quality in both how it is made and also the text and image that is printed; The Lanyo is made up of three parts, lanyard, safety breakaway and the badge reel which can connect to any holder or wallet available. 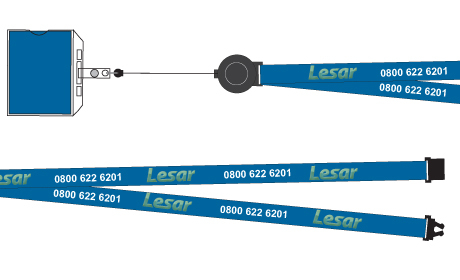 Also with the break away feature, this is the ideal product for any NHS, Hospital or School; if the lanyard gets trapped or pulled it will simply disconnect breakaway.